What’s the Project? 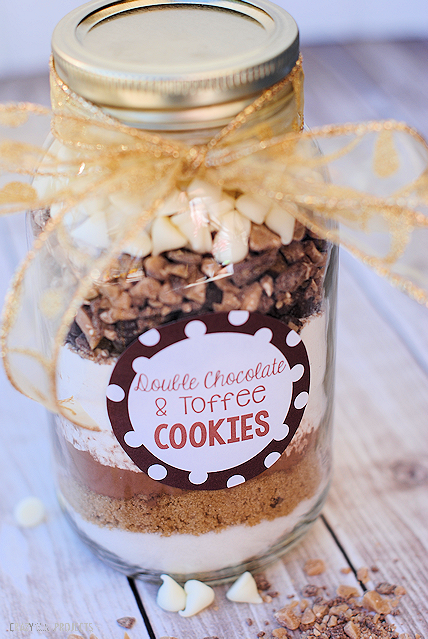 Looking for a fun Christmas cookie mix in a jar recipe to use as a gift this holiday season? Here are two great ones with free printable tags and instructions. I’ve got a major thing for baking cookies. If it rains or is stormy, you’ll find me baking cookies. If it’s near Christmas, you’ll find me baking cookies. A friend needs to be cheered up? You guessed it-I’ll be baking cookies. Baking cookies is also something that I love to do with my kids, especially at the holidays. And I love to eat cookies at the holidays. So I feel like a cute Christmas cookie mix in a jar is the perfect gift for neighbors and friends during the holiday season so that they can enjoy baking and eating Christmas cookies as well. 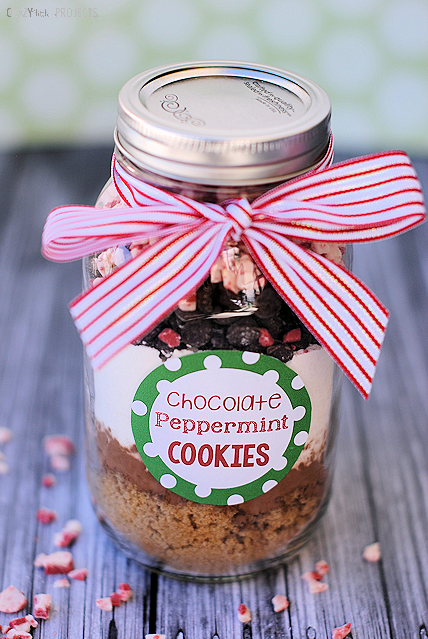 Plus, these Christmas cookies in a jar gifts are so cute aren’t they! And not hard to put together. I did them for neighbor gifts a few years back and it was wonderful! I think this double chocolate toffee one would be a beautiful one for a Fall or Thanksgiving gift as well. Don’t those look so fun and festive? Really they could be used any time of year, but I thought they were perfect for the holidays! Plus I kind of love mason jar Christmas gifts. They are just so cute! Use this tag for the front (right click to save). I printed this on sticker paper. The other option is to print on plain paper and glue it on. Here is a recipe card to attach to the back. Again, do the following: Grab a quart size mason jar and begin layering the following ingredients. Kind of tap the bottom of the jar on the counter as you go to get everything to lay down into the jar nice and flat. Put it all together with a cute bow and you’re all set! Then they can bake these great mason jar cookie recipes whenever they are craving cookies. 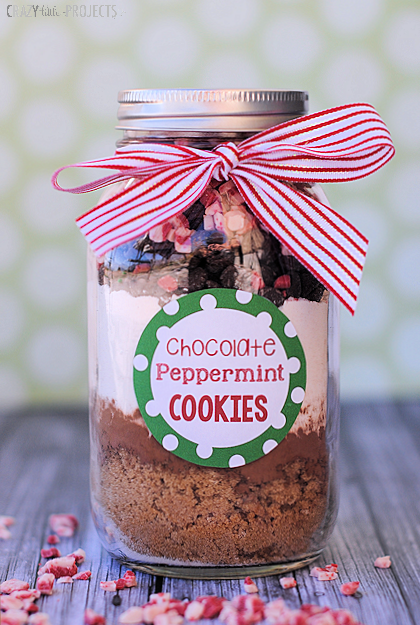 They are going to love this Christmas cookie mix in a jar gift! to go in gift baskets! They look beautiful! I also made a batch to eat and they are delicious! ! It’s been a few years so I don’t totally remember but I want to say around $5-7 each? These look great! I have so many jars and would love to use some up! Which cookie did you like better? 1 stick of butter (or 1/2 C) is 4 oz. I did that and it was yummy however if they sit in the jar too long, mine sat for a week before I tested them out, the crushed candy cane became hard. I would recommend putting the crushed candy cane or the toffees in a plastic bag. Good tip! I used candy cane bits from the baking section, not actual candy canes. That might help too! You dump all the jar fillings into a bowl, add the butter and egg, mix and bake. Love these ideas and your site. Very creative and fun. Thanks for creating and sharing….! Love this idea! Nice for Xmas gifts. Thank you! How much would you say these cost per jar? 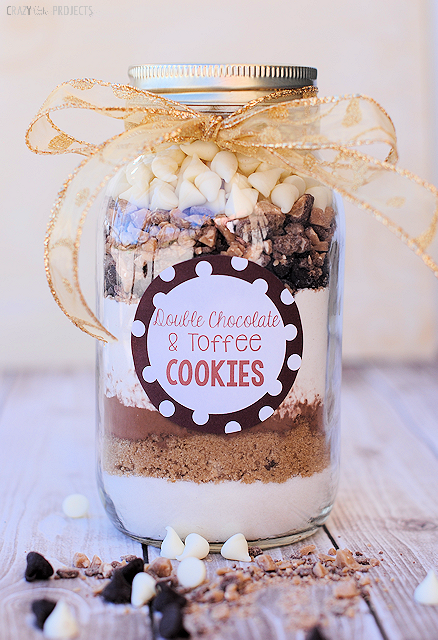 I’ve always wanted to make cookies in a jar gifts. How big of a jar did you use for this recipe? How many cookies will a 32oz jar make? 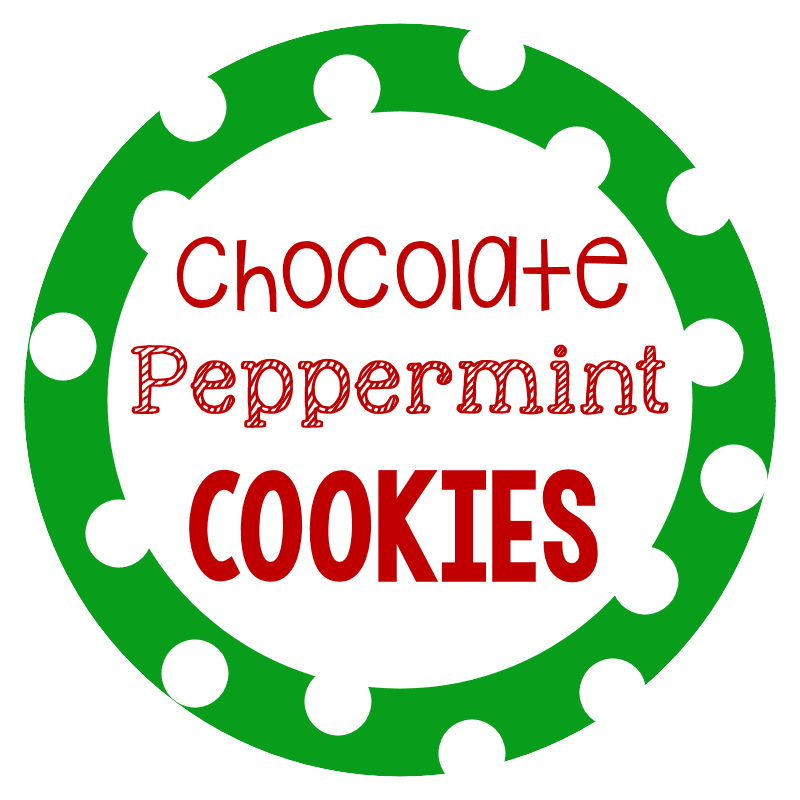 Will the Chocolate Peppermint cookies have about 18 cookies in a quart size jar as well? You’d have to cut down the measurements to fit in a quart size? Meaning, the amount of ingredients for the mix in the quart-sized jar, would that make about 18 cookies…? These look so pretty. 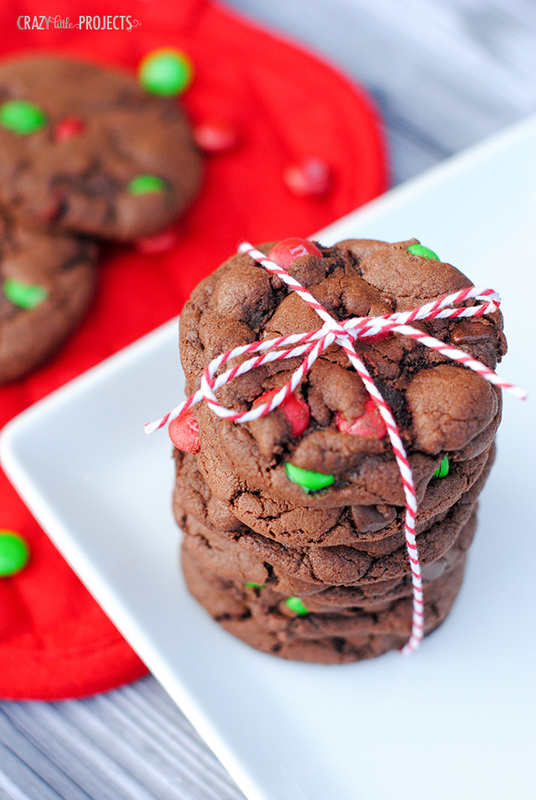 I host a Cookie Exchange party every year and these will be great party gifts. Thanks for the ideas. Thank you so much for these recipes have been searching for some. Want to hand out to friends for Christmas. love this! how did you get the tags to stick to the mason jar? I printed them on sticker paper. This looks great! I’m having trouble finding sticker paper though. Is it at a craft store or an office supply store? Thanks! Either really. 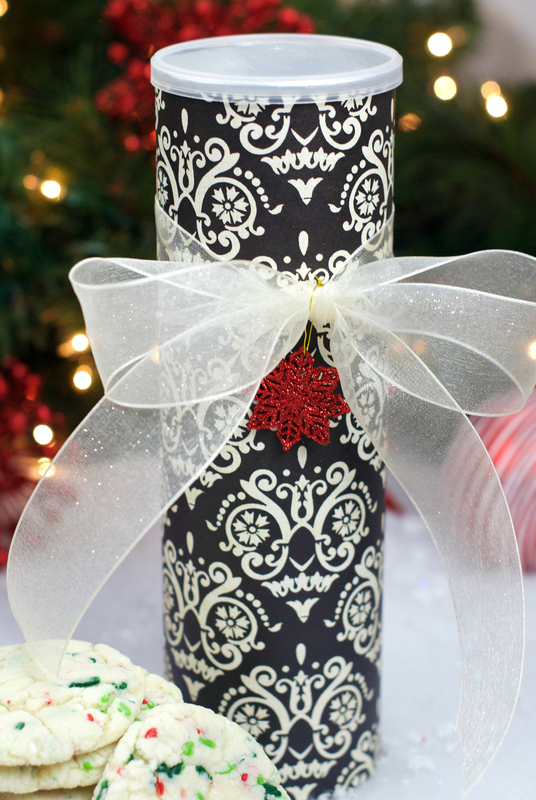 Cricut and Silhouette both sell it or you can use address labels. Thanks so much for the great recipe and beautiful labels, I printed mine on card stock, poked a hole and hung them from a ribbon like a gift tag and it looks great! Thanks again, yours is the nicest on Pinterest…Happy Holidays!! Thanks sooo much for this cookie in a jar receipe. You just solved a big problem I had for Christmas. I have several people on my gift list that I needed a gift idea for. This is perfect. It’s fun, pretty and perfect for saying Merry Christmas without coating a lot. thanks for the recipe…..looks yummy! I am in Australia what did you use for toffee bits?? This is such a wonderful idea. So clever, and the peppermint choc. chip cookies turn out great. Thank you so much for sharing!! There is a typo. on chips (chps) on the how to make information. Is it possible for you to fix it please? Hoping to borrow this idea for a couple of kid making gifts for Christmas. Wow!!! Sorry about that. It is fixed! How long can do the mixes keep before going bad? Not sure actually but quite a while. Nothing in it is overly perishable. These are adorable, and the printables that go with them are super cute. Just wanted to let you know you misspelled the word “chips” in the printable ingredient list on both cookies. What a great gift idea! Thanks! These are so adorable and delicious looking. How do you print the labels from Pinterest? Where did you get the sticker paper? Mine is actually shipping labels. But Silhouette and Cricut both sell it too. Sure! I think you could do that! is the cocoa powder sweetened? Like the powder you use to make chocolate milk? Or is it the same as baking cocoa? No-baking cocoa. The unsweetened kind. What type of sugar is used? They look super yummy! I accidentally bought too small of jars. :/ Do you think it is possible to cut the recipe in half to make it fit in the smaller jars? I love this idea and am actually planning on giving a bunch of these as gifts for Christmas this year. But I was wondering, does the recipe still turn out well if you dump all the ingredients into the jar and mix it with the added wet ingredients or do I need to tell people to separate some of the ingredients first (i.e. the sugars to be mixed with the butter and egg before adding the rest of the contents of the jar)? Nope-it should be fine in this day of Kitchenaides and Bosch mixers I think. Ya, I noticed that AFTER I gave it to my neighbors. I will try to get that fixed today! Thanks so much for the printable PDFs! The chocolate peppermint cookies have white sugar in them as well as brown? In the photograph, it looks like it’s just brown sugar at the bottom there..or did you layer it with the flour? I made the double chocolate toffee cookies. They are SOO good! Huge hit in this house! I am making jars to give away to families in our church on Sunday. my only problem: I could only fit 1/2 cup of each of the chips in the jars (so instead of 2/3 cups of the chocolate chips, toffee, and white chocolate, I only used half a cup). Wondering if there I some way you can help me edit the template for my jars? To put the correct amount? Thanks for such a great recipe and idea! You could right click and save and then add a white box on top of it (use picmonkey.com) and retype those ingredients. I didn’t think of that!! Thanks! One more question- do you remember what font you used? I want it all to match. Thanks for your help and for the great recipe! I love this!!! Did you have to do something special with the mason jars like heating jars/lids to seal them? No, I didn’t seal them. I guess I assume the people will use them soon and the ingredients will be fine! The batter is dry and crumbly! What did i do wrong? Did you add the wt ingredients? Both of them? Thankyou for such wonderful ideas and inspiration. but i was wondering, if you could please consider both imperial and metric users in your printables? in Australia (G’DAY) we eat biscuits and cook in Celsius. the biscuit/cookie thing drives me nuts over here, or maybe an option to add our own wording? im not very good at the computer/deigning thing, so it’d be awesomely helpful to me. id even pay for it. Sorry, I know nothing about metric so I really can’t! Maybe google can help? Wish the crafts pictures and directions could be printed without all the comments! That takes up a ton of paper that is unnecessary!!! Copy and paste into a word document, then print. That should work. Hello! I recently received one of these jars as a gift and I had a quick comment. The brown sugar in the jar set up extremely hard (think hockey puck). We broke the jar getting it out so I came here for the recipe. If I mixed the white and brown sugars before putting them in the jar, do you think that would help? Hmmm, I have no idea! I wonder how long it sat before they gave it to you? I have no idea. That could definitely be a factor – I’ll make mine close to giving them away and advise people to enjoy them soon! These jars look absolutely beautiful! I was just wondering what type of white sugar is used in the recipes, whether its granulated or caster. In the double chocolate and toffee cookies it looks like there are oats in the jar above the cocoa. Just wondering if this has been missed from the list of ingredients? Hi! So I did the cookies in a jar gift recipe, and bake the cookies. But when taking it out of the oven they were bad. I followed all the directions, I also did ll the recipe 2 times. Both times they got stuck to the paper and made a mess. I am not saying it to offend anybody, I just want to know why? Sorry but I didn’t liked it. Making these for our holiday shop at school for kiddos to buy! thanks for the idea! I was wondering what size sticker paper to buy? or what size punch will work to cut out the circles? My sticker paper is full size-like 8 1/2 by 11 so that I can print on it. And then I just cut with scissors. Thanks so much for this great idea. I made these for a fundraiser for the Humane Society and sold them in my office for $10 each. They were a huge hit & we raised over $300!!!! Made these for teacher gifts and made one for us to keep. The kids and I made them today and they are amazing!! mmmm! Thanks for a great cookie recipe and gift idea! Hi, my 6 year old got the Chocolate Peppermint jar at a gift exchange, we made it and it’s so good!!! Now we are making jars to give to her teachers for Christmas. Thank you so much for the recipe! Ok, I HAD to comment. These are just that good! I guess I have always assumed that cookie in a jar gifts are a little cheap and lame. That is, until I became a mom and realized how much I would love to get some yummy mixes in a jar that make dessert or meals that much easier! So I decided to make these this year for the first time for unexpected or last minute gifts. I am SUPER picky about cookies and figured that, while cute as a jar mix, the cookies probably wouldn’t actually taste that great. I was expecting flat pancake cookies with too much flour or sugar. 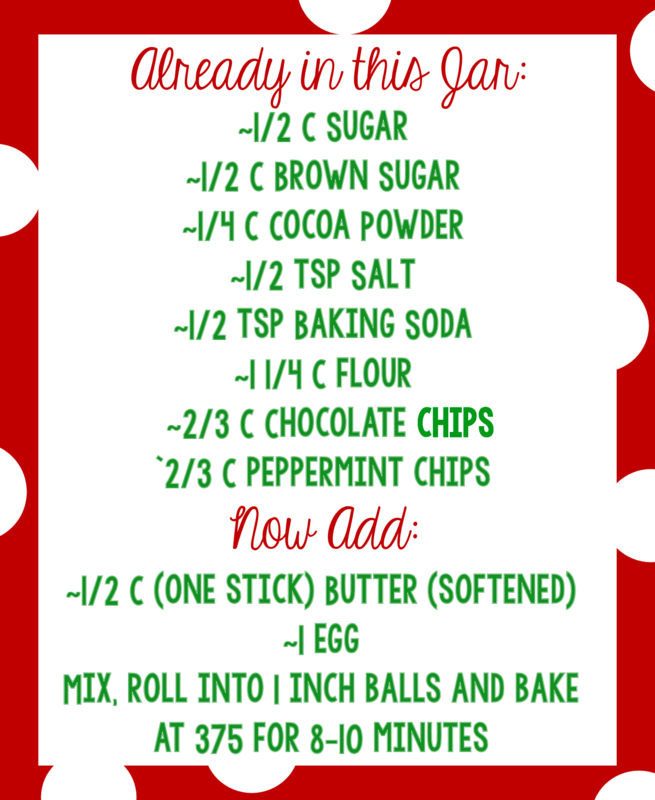 Tonight my husband and I made your Peppermint chocolate recipe using andes mint chips. THEY. WERE. AMAZING. Thick, moist, chewy and lots of chocolate! Almost like a brownie cookie. 8 minutes was perfect. I am SO glad that I decided to make these as gifts because I know they will be appreciated :) Also, the mix made 24 cookies for me. A lot more than I was expecting! So from a skeptic, these are to die for. Thanks for taking the time to share! Merry Christmas! Ha ha ha! Happy to hear you enjoyed them! you made the same recipe from here ashley with one egg and 1 stick softened butter ? did you use unsweetened cocoa powder or dark chocolate? Hi These are SOOO cute! 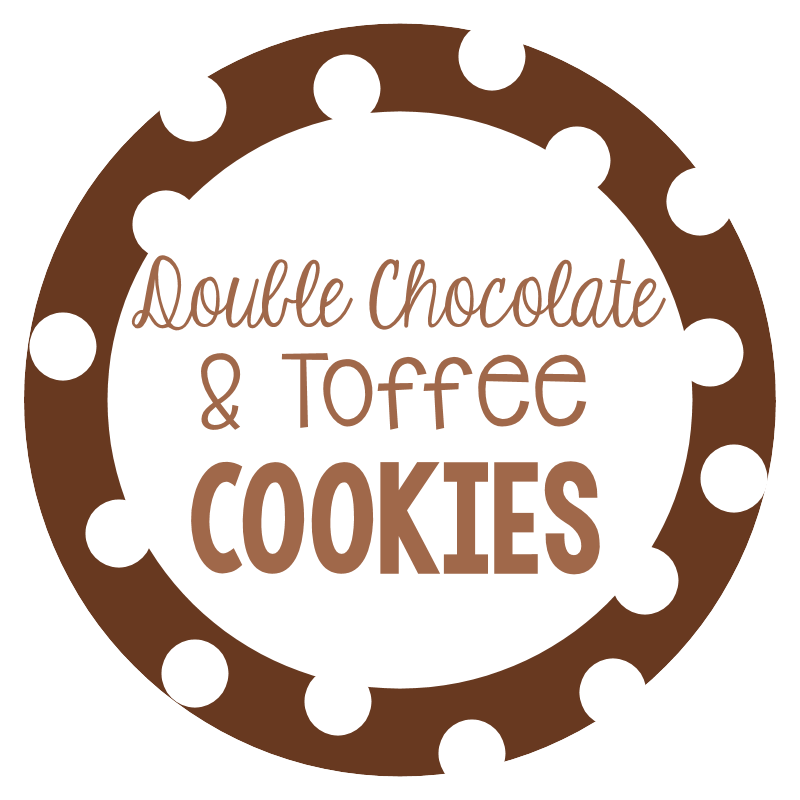 I can’t wait to try the double chocolate toffee! I am going to be using Pint size jars. Has anyone adjusted the measurements for this size? Thanks for your help! I would like to make these in pint size too- I can cut most of the ingredients in half but what do you do about the 1 egg??? They can always sort of half the egg? I’ve done that before. Just wanted to say that I added 1/4 cup of milk, because the batter was a little too dry and mixture wasn’t wet all around. They came out still really good. I got 2 dozen cookies out of it, about 2 – 2 1/2 inches in diameter. I always add milk actually. Just makes them chewier. Thanks for sharing the amazing recipes, I made the double chocolate toffee cookies today and they turned out great. Keep posting. HI! thanks for the great idea! I wanted to know what the measurement of margarine would be instead of using butter? DId you use milk chocolate chips or semi sweet? I prefer semi-sweet, but you can do either. I am planning on doing this as a classroom gift for each family. Do you know how much I would need of the ingredients for 25 jars? Or do you know of a website I could go to that could help with the measurements? Holy cow! That sounds awesome but I’m not totally sure how to figure it out quickly and easily? Red and White chips are hard to find. I got the regular Andes mint baking chips. These were good but I did have to add a couple tablespoons of water. They were pretty dry and I found that melting the butter a little helps as well! Super yummy.